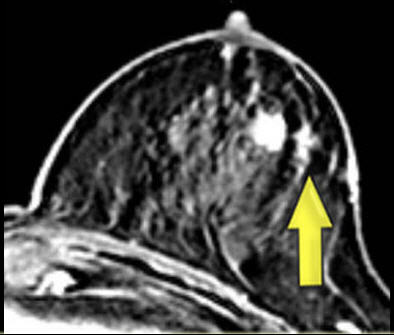 Breast MRI is a very sensitive imaging tool that identifies most, but not all breast cancers. 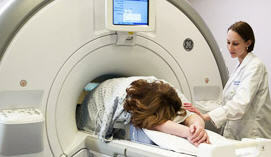 The MRI scan is used as a diagnostic test following a screening mammogram. Breast MRI is used in conjunction with the mammogram to provide additional information for the detection or characterization of breast disease. Each exam produces hundreds of images of the breast, cross-sectional in all three directions (side-to-side, top-to-bottom, front-to-back), which are then read by a Radiologist. • Breast cancer staging: determines the extent of disease prior to breast surgery. • Screening both breasts after detection in one breast: MRI can detect unsuspected disease in the opposite breast in at least 4-5% of breast cancer patients. .• Evaluating patients with positive surgical margins for residual disease: To help determine which patients could be effectively treated by re-excision or whether a mastectomy is required due to the presence of more extensive disease. • Silicone and non-silicone breast implant evaluation: Evaluating breast implants for rupture and detecting cancer in women with breast implants. How is a MRI Guided Breast Biopsy Performed? You will lie face down on a moveable MRI exam table and the affected breast will be positioned into openings in the table. A technologist will insert an IV line into a vein in your hand or arm and the contrast material will be given intravenously. Your breast will be gently compressed between two compression plates, one of which is marked with a grid. The radiologist performing the biopsy uses the information from the MRI exam to identify the tissue that should be sampled. Computer software calculates the position of the lesion with respect to the grid and determins the depth of the needle placement. A local anesthetic will be injected into the breast to numb it. A very small nick is made in the skin at the site where the biopsy needle is to be inserted. The radiologist then inserts the needle, advances it to the location of the abnormality and MR imaging is performed to verify its position. Once the position is verified a sample of the abnormality is collected. The sample will be taken to a pathologist for evaluation. The radiologist and your doctor will receive a copy of the pathologist’s report.